Here we go with the first competition on toblip.com and I hope you really like the price. 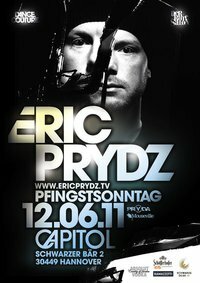 As mentioned in the latest event tips Eric Prydz will play in Hanover on the 12th June 2011 and now you have the chance to win a pair of tickets. What you need to do? It’s actually pretty simple. Just become a fan of toblip.com on facebook and there you go. The randomly winner will be announced on the 5th June through Facebook (wall + direct message) so you’ll have enough time to plan your trip to Hanover. If you can’t make it to Hanover please let us know so we can pick another winner. For more information check this facebook event.